New members of Intuit's Strategic Advisory Council gathered on Friday night for a celebration of the Council's formation. 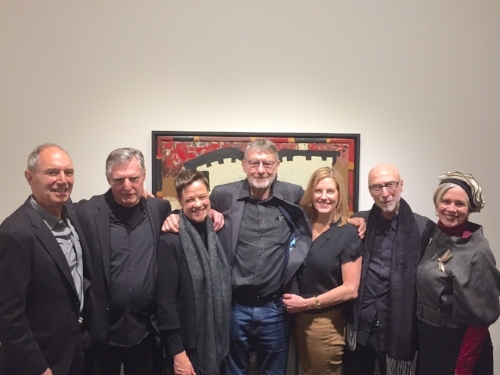 From left: Scott Lang, Victor Keen, Leslie Umberger, John Maizels, Ashley Langley, Frank Maresca, Debra Kerr. CHICAGO--At Ricco Maresca Gallery's annual Winter Party in New York, held last night in conjunction with the Outsider Art Fair, Intuit introduced its new Strategic Advisory Council comprised of prominent members of the arts and culture sphere who will offer their talents, voices and experience to help shape this critical time in the history of the Museum. "Intuit is in the midst of transforming its operations and physical space, a process that positions Intuit to become a museum for the 21st century and to increase its reputation nationally and internationally as a preeminent advocate for outsider and self-taught art. Intuit simultaneously engages in and actively advances the genre, with the Strategic Advisory Council serving as a pillar to both efforts," said Scott Lang, Intuit board member and chair of the council. Made up of knowledgeable, influential leaders from diverse backgrounds, including notable collectors, curators, dealers and museum administrators, the Council will provide advice and expertise for strategic options and opportunities available to the Museum. "As the Museum moves forward, the Strategic Advisory Council will help ensure Intuit is inclusive, diverse and relevant, so new audiences discover the outsider art genre and all audiences are encouraged to tap into their inner creativity," added Intuit Executive Director Debra Kerr.